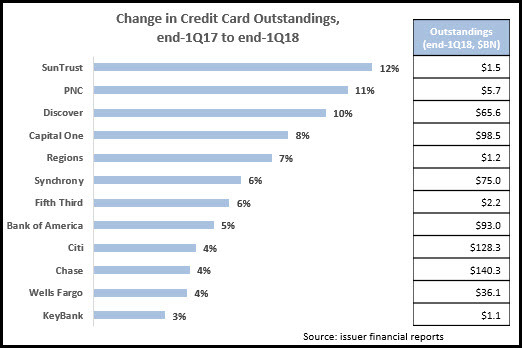 Most leading U.S. credit card issuers reported relatively strong y/y growth in outstandings in the first quarter of 2018. Breaking these growth rates out by FICO Score segment, we see that issuers generated growth across multiple FICO Score categories. There are important differences in the FICO composition of card portfolios. 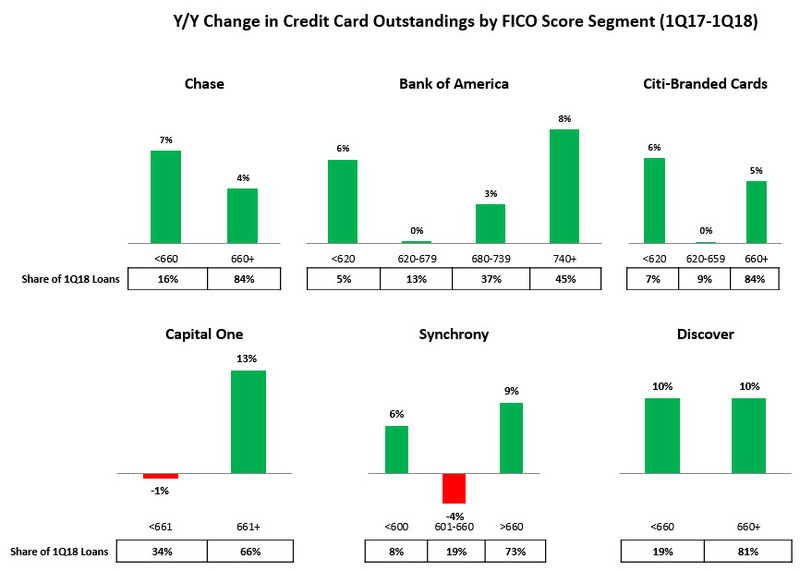 The <660 FICO Score segment accounted for 34% of Capital One’s portfolio, a much higher percentage than other issuers, such as Fifth Third (3%), Chase (7%), KeyBank (11%), Citi (16%) and Discover (19%). Among the largest issuers, one of the most notable trends was strong growth in the low-prime/sub-prime and super-prime segments, but low/no growth in their prime portfolio. Bank of America grew its sub-prime (<620) outstandings by 6% and its super-prime (>720) increased 8%. However, its loan portfolio held by consumers with FICO scores between 620 and 739 only increased by 2%. Most regional bank card issuers (such as PNC, SunTrust and Regions) reported strong growth in their sub-prime and near-prime portfolios. 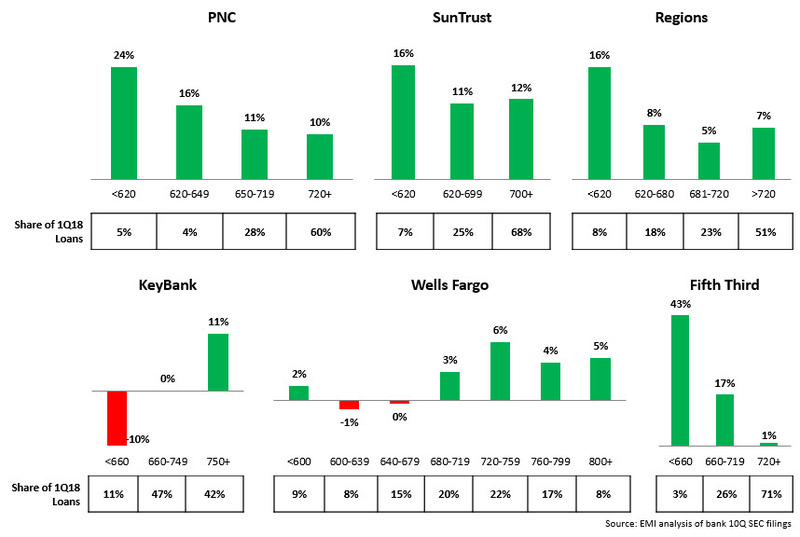 Fifth Third’s <660 FICO Score portfolio rose 43%, but this category only accounts for 3% of the bank’s credit card portfolio, so growth was from a very low base. As issuers enjoy strong growth in their credit card outstandings—especially for sub-prime and near-prime consumer segments—it is worth noting that charge-offs are also on the increase. Most issuers reported double-digit y/y basis-point growth in their credit card net charge-off rates. Four of the 12 issuers below now have charge-off rates of more than 4%, and only one (American Express) has a charge-off rate of less than 3%. This entry was posted in Credit card and tagged Bank of America, Capital One, Chase Card Services, Citi Cards, Discover Card, Fifth Third Bank, keybank, net charge-off rate, PNC, prime, Regions, sub-prime, suntrust, super-prime by mronan. Bookmark the permalink.